-The ultimate insider's guide to Baltimore, fully illustrated with 111 full-page color photographs -Features interesting and unusual places not found in traditional travel guides -Part of the international 111 Places/111 Shops series with over 170 titles and 1 million copies in print worldwide -Appeals to both the local market (nearly 3 million people call Baltimore home) and the tourist market nearly 25 million people visit Baltimore every year ) There is possibly no city in the United States as misunderstood as Baltimore, and yet there are few that can match it in majesty. One of the oldest Great Cities of America, Baltimore is profoundly rich in history and culture. But its character is not only derived from its past: Charm City's present and future belong to the thousands of artists and innovators who call it home. Baltimore is full of adventure and surprises. You'll visit the site of one of the most notorious scenes in cinematic history, and a candy shop that birthed a legendary R&B group. You'll hear music performed by future classical music stars, grab a bite at the last old-fashioned Polish smokehouse on the East Coast, and spend a day on a street art scavenger hunt. 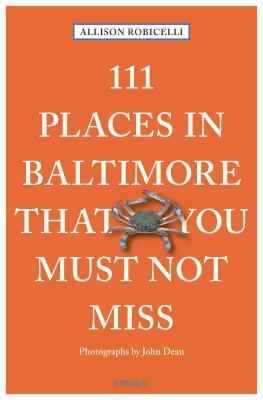 You will find 111 hidden places in Baltimore, whether it is your first time visiting or your 20th time, and even if you have been here for a lifetime. The city is yours to discover. Allison Robicelli is an author, chef, entrepreneur, and backyard adventurer. She is the author of the critically acclaimed cookbook Robicelli's: A Love Story, With Cupcakes, and has written for Food52, Eater, SheKnows, Food Network and more. A lifelong aficionado of municipal history, she has a passion for treating cities as playgrounds, unearthing hidden treasures and seeking out untold stories. Born and raised in New York City, she was drawn to Baltimore for its creative spirit, impeccable architecture, robust culture and vibrant communities. She lives with her husband, two children and three cats in Baltimore's most charmingly titled neighborhood: Pigtown.